What format was chosen for the report? 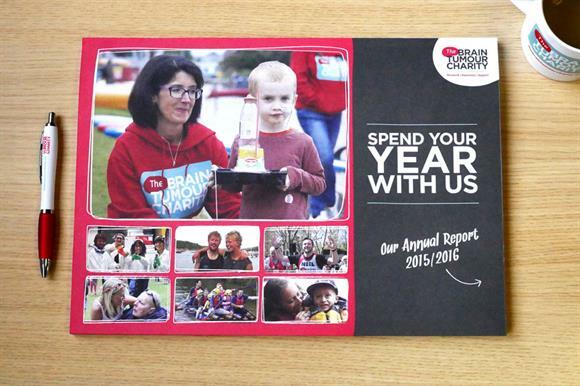 Many charities struggle to make their annual reports engaging and living documents, but the Brain Tumour Charity came up with the idea of making its offering, Spend Your Year With Us: Our Annual Report 2015/16, an office accessory that would have greater longevity and a better chance of being referred to regularly. The charity made the report double up as a deskpad, complete with space for notes, to-do lists and even brainteasers, as well as information about landmarks achieved by the charity over the past year, key facts and case studies. It hoped the innovative format, which includes different pages for each week of the year, would enable it reach more than just the person it was addressed to and would encourage supporters to remain engaged with the charity throughout the year. With a budget of £4,000 for print, the report was completed in-house to keep costs down and ensure that as much money as possible could be spent on achieving the charity’s goal of doubling the survival rate of people with brain tumours. Why did it choose this approach? The Brain Tumour Charity hoped that, by learning something new about the charity every week, those who read the report would become advocates for the charity and encourage others to support it. The deskpad, which includes diversions such as word searches related to the charity’s work and logic problems, was also intended to inspire people to become part of #TheBrainyBunch, a community committed to defeating brain tumours. Clare Lucas, activism manager at Mencap, said it was "an incredibly clever idea that has been brilliantly executed". She said: "The calendar layout is engaging and allows supporters to digest the report at a leisurely pace. It also means that the report lasts for the year, rather than being read and discarded."